Cecil Rhodes said: If God exists, the most important thing in the world is to know him. But how can we know God, or even know about God? 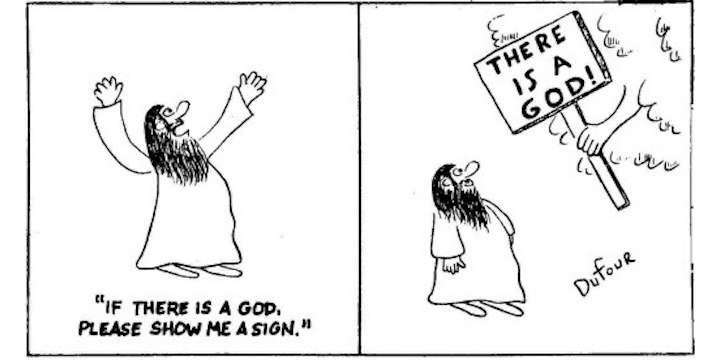 If we believe there may be a God, what next? Do all religions lead to God? Does God even care if we believe in any religion? Or has God done something to gives us clues that he’s there? This page considers these questions. Maybe God’s like a father in heaven, or maybe it’s more like an impersonal force. Maybe she really cares what we do, or maybe not. It is really important to know what’s true because it will affect how we choose to live. But how can we be sure? We surely can’t just believe what we like – a lot of people treat religion this way, but that would only be sensible if God doesn’t really exist to contradict our ideas. So we need to work out what is true. There seem to be three main possibilities. Option 1. All religions may lead to God. This is an attractive idea. It gives everybody, whatever they believe, the opportunity to experience God and an afterlife. Everyone’s a winner! But it is hard to see how it could work. For example, what if our local religious practices included human sacrifice, as did the religions of the Mayans and the Canaanites? Would that lead us to God? It seems then that at least some religions don’t lead to God, or even acceptable behaviour. So, like everything else we know, some things are going to be true about God and some are not. Either he cares how we behave, or he doesn’t. Either she approves of some sorts of behaviours, or she doesn’t. Is that belief true, and therefore also arrogant? We don’t have to think if one belief is true then all the others are totally false. We can surely believe that truth can be found in all sorts of places, but that nevertheless, some beliefs capture more of the truth than others. In the end, the world is like that – some things are true and some things are not. If one thing is true, its contrary is false. In politics, relationships, ethics, employment, leisure, etc, we all have to make choices. Option 2. God may exist, but wants us to live a good life without any promises or threats from him. This view is superficially attractive. It provides the comfort of believing we are not alone and that death is not the end, and it doesn’t require us to hold to any particular religious beliefs. It is a belief often held those who are not strongly committed to any religion, but is less common among those who have committed themselves to knowing God and following a religion (they may find it insulting to their faith). However, this view presents some difficulties for the honest enquirer. It is virtually impossible to be confident whether this view is right or wrong. There is no evidence for it beyond our own hopes. Pretty much all the religions of the world claim that their way is true and others are not, so it is hardly a unifying viewpoint. It seems to be based more on hope than logic. If it is true, how do we know what this God thinks is ‘good’, how do we know how God wants us to live? Most religions have many common ethical teachings, but most also teach some different things that God requires from us. Why should God (if she exists) be happy for her children to have quite contradictory beliefs? Thus, like the previous idea, it doesn’t take us very far. Option 3. If God exists, and wants us to know him, he would do something to let us know. The previous two ideas do not seem to take us very far – we are still left having to consider what God may be like. It can very nice to think about the human search for God, but it is an idea which raises problems. If we mean a deep and meaningful search, via philosophy or meditation, it seems to leave out those with insufficient intellect, education, spiritual awareness or time to make the search. So if God was fair, surely she would give us a few clues, give us something to go on which virtually everyone could understand. Surely God is at least as eager as a parent trying to communicate to a newborn baby through the glass at the hospital? And surely there’d already be millions of people who had already found him, or the way? So if we want to have a go at ‘finding God’, we should maybe start looking for a religion, or teacher, or idea which has already gained large numbers of followers. We may not find our answer, but it’s a logical place to start. And we might just want to ask God (if he or she exists) to show us the truth.